SadintheCity is doing its first contest – be sure to see bottom of this article for details! Since my mother died, I have felt it my filial duty to honour her memory the best way I know how: by telling absolutely everyone that my brother won the gold medal in medical school. My mother used to throw that around like underwear at a Tom Jones concert. In the seven years since she’s been gone, however, my brother’s accomplishments have multiplied, the coolest among them being the plastic surgery clinic he opened up on Sunset Blvd. in Beverley Hills where he specializes in rhinoplasty. It upsets me that my mother never got to see him settled in his beautiful clinic, the one that he designed and built himself. I hate that she never got to visit him, tell strangers in the elevator that he was her son and flush with pride hearing happy staff and patients gush about his talent as a surgeon and warmth as a person. I just know she would have loved it. Because she never got to do those things, it is my job now to pick up the slack. It’s my responsibility to embarass my painfully modest brother by trying to invent a new superlative in talking about his achievements, by telling people that my big brother could beat up their big brother…and then fix his nose (and by writing a blog post about him!?). There is just one problem: I have a terrible nose. Being elbowed in the face while playing basketball at eighteen has left me with a sizeable bump in my bridge. That, and I’m Jewish, so my baseline sniffer wasn’t so great to start with. I have made peace with my nose in terms of my appearance but I am worried that it’s bad PR for my brother who wrote the book on rhinoplasty. I don’t mean this figuratively, he actually wrote a text book on nose jobs. When people ask me what my brother in L.A. does, I feel them sizing up my nose and thinking, “really?” Saying your brother is a nasal surgeon with a nose like mine is like saying your dad’s a dentist through crooked teeth. Wait. My dad is a dentist. And my teeth are crooked. Damn it! Is my family disappointed that I decided to keep my maiden name? I have been wearing a retainer at night for longer than I would care to admit, but I never really considered getting a nose job until I was diagnosed with a deviated septum in my early twenties, a condition in which the bone and cartilidge dividing my nasal cavity in half is off center. Kind of like my thoughts. This essentially means that I haven’t been able to take a deep breath for over ten years now. Worried that my perpetual sniffles might be interpreted as some sort of drug addiction, I agreed to see an Ear, Nose and Throat specialist. Unfortunately, before my brother had graduated. “Will that help me breathe better?” I asked. I would have rathered people think I could out-snort Courtney Love in a cocaine sniffing contest than let Dr. Shithead anywhere near my face. Visiting my brother in L.A. some years later, he informed me that my septum could be fixed structurally without actually making any radical changes to my appearance. Perfect. Taking a picture of me, he then used a software program to show me what I would look like post-surgery. “I want to look like me,” I said, as he clicked on the keyboard, “just a me who can breathe.” I continued to sermonize about how at peace I was with my appearance, how I didn’t want any drastic changes. Ta da. My brother finally held up a digital, post-surgical image of me that was extremely disappointing. It looked just like me! My brother dutifully clicked away to reveal a much better version of me. Totally natural, but way better. My new digital button nose was so natural in fact, so subtley corrected and effortlessly good, that you would never even be able to tell that I got a nose job! It was all still too real. I wanted to look better! My brother made a slight, understated enhancement to my lips. My big brother stopped, rolled away from the computer and looked at me, smiling. Looking at him, looking at me, I felt like the best version of myself. And who am I to question a gold medalist!? I do hope to eventually straighten out my nose. Right after my thoughts. 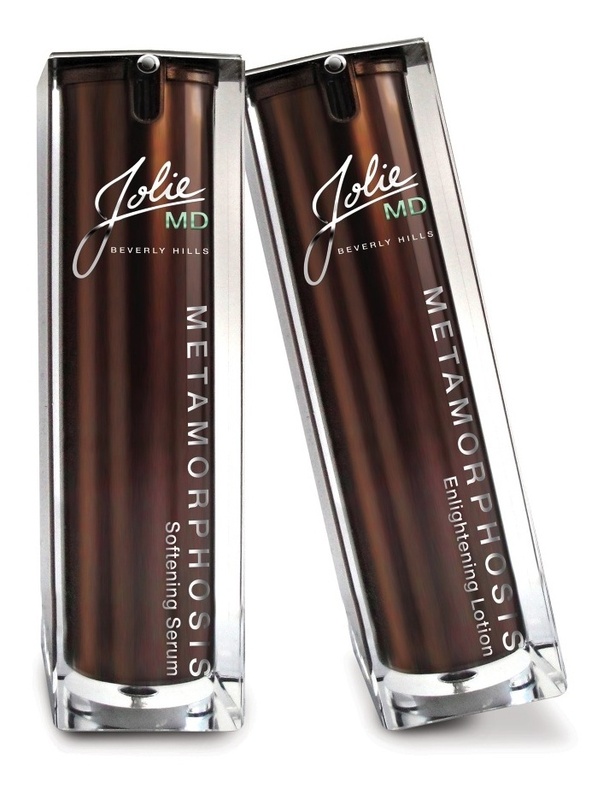 Along with running a medical practice, my brother has also developed and launched a new skin care line, called Metamorphosis by JolieMD. I’m so excited to be able to give one of my subscribers a set of Metamophosis’ 2-step skin regime of Softening Serum and Elightening Lotion (approximate retail value $96 US)! This stuff is amazing. Like gold. And I’m not just the doctor’s sister – I’m a Metamorphosis user as well! All current subscribers will receive one entry in the draw. For every new subscriber this week that mentions your name when they subscribe, you will receive 2 BONUS entries. So if you enjoy this blog, please encourage your likeminded friends and family to subscribe as well. The draw will take place on Monday, November 21st. As I read through I had to giggle and realize that although I’ve lost one parent, I don’t have to carry the burden such is yours to memorialize my sibling throughout his astonishing career. And then I realized, neither does my brother. Neither of us have done anything “noteworthy” in the eyes of the world. I’m not even sure I’ve done much in the eyes of my children other than finish college at age 43…and yes …I’m still hip. I dance around the house to the latest music (my jiggly arm fat keeps rhythm…could your brother recommend a fix for that…?) and attempt to sit through the latest movies and video games. Attempt. I wonder if they will live to honor me when I’m gone by embarrassing their children as well? I can dream. frankie, you sound amazing and your kids are lucky to have such a cool mom. Your significant accomplishments, including getting a degree AND raising a family, are more than enough to earn you retirement! I have only done half of that and I shall now brag to people that you read my blog. Thanks for checking it out! Thanks so much Elizabeth! Much better to laugh then cry. I just hope people are laughing with me, not at me! Your contest smacks of blatant partisonism. I am considering cancelling my subscription, but not until Nov. 22! Sorry to have offended your sensibilities, Pete. I was thinking though that my contest was synergistic as opposed to partisan. As you contributed to my business degree, I thought you would have been pleased with your ROI. Ah, plastic surgery and brothers… I have a brother, and I’ve had my deviated septum ‘fixed’. We’re practically related! I’m envious that you and your brother can be in the same room and actually ‘look’ at one another. My brother and I can’t talk on the phone without reverting to our high school selves. But I digress. If you are depressed and truly ‘sad in the city’, (both of which I know a lot about- see we are related) you’re writing is your salve, protector and best friend. Thanks for the read. Loved this tribute to your brother! And to right-thinking medical professionals everywhere. Noses unite!!! Wait, that didn’t sound right . . . I guess the nose job statistics will largely depend on the expertise of cosmetic surgeon who will be doing the surgery.